If you've got an Apple, Mac, or iOS tech question, we have the answer. This time the question comes from a reader who wants to know how to use his iOS device to access the files he's placed in iCloud drive. This used to be quite a headache, but thanks to the recently released iOS 9 it's no problem. Read on to see how it's done. I added a folder in iCloud on my Mac and I placed a file in the folder. How can I see and open the file on my iOS devices? 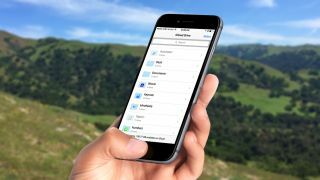 With iOS 9, Apple has included a new app inside of iOS that lets you easily access your saved documents, folders and files inside of iCloud Drive. Whenever you save a file to iCloud Drive on your Mac, it will synchronize with your other Macs and iOS devices, and the iCloud servers and be available on all of your devices nearly immediately. To access the files, all you have to do is use the iCloud Drive app, but it's somewhat hidden. 2. Navigate to iCloud > iCloud Drive. 3. Enable the option for "Show on Home Screen." Activate the iCould Drive app in Settings iCloud. When you enable this option, a new iCloud Drive app will appear on your home screen that allows you to peruse the various folders of content in your iCloud Drive, download files, and open them with compatible apps right from within iOS for editing and saving. The new iCloud Drive app in iOS 9 lets you easily access your online files.